Evergreen Building　（日本語に訳すと「常緑ビル」かな？）はカナダで指折りの建築家、Arthur Ericksonによってデザインされた。ダウンタウンにあるオフィス用ビルで、各オフィスにバルコニーがついている。バルコニーからはノースバンクーバーの山々が見渡せる。素敵でしょ？このビルは電気会社、BC Hydroの元会長、Laxton氏が所有している。彼はこの建物に４階分増築して居住用アパートに改築するつもりだった。しかし、市がこの改築を認めなかったため、Laxton氏は、このEvergreenビルを壊して超高層ビルを建てるしか方法がないという結論に至った。OH NO! 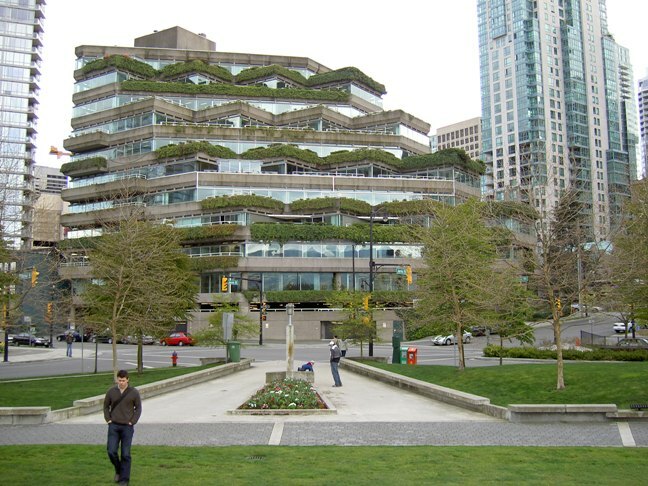 The Evergreen building was designed by one of the best Canadian architects, Arthur Erickson. This is an office building in down town and each office has a balcony. You will be able to see mountains of North Vancouver from the balconies. Isn’t that nice? This building is owned by Mr. Laxton, ex-chairman of BC Hydro, an electric company. He wanted to renovate this building for residential purpose by adding four stories on top of the building. However, the city council didn’t approve this renovation and Mr. Laxton reached to the conclusion that a new skyscraper should be built after demolishing the Evergreen building. OH NO! Heritage Vancouver which is an organization to support heritage buildings, requested the city council to approve the four stories addition plan to protect the Evergreen building. Now the future of the Evergreen building is in hands of the city council. I strongly urge the city council approves the four stories addition plan. 車椅子用の階段が好き。We like the stairs for wheelchairs. I didn’t know this was designed by Erickson. No wonder it’s so cool. The artificial waterfall is beautiful. 見に行きたいなぁ。I really want to visit here. We went to this museum this winter but I didn’t know this was designed by Erickson. Doh! Please visit here for updated good news!